A little melted butter is not going to make this monster disappear! The Japanese spider crab has the greatest leg span of any arthropod, reaching up to 5.5 metres (18 ft) from claw to claw. The body may grow to a size of 40 cm (16 in) in carapace width and the whole crab can weigh up to 19 kilograms (42 lb)—second only to the American lobster among all living arthropod species. The males have the longer chelipeds; females have much shorter chelipeds, which are shorter than the following pair of legs. Apart from its outstanding size, the Japanese spider crab differs from other crabs in a number of ways. The first pleopods of males are unusually twisted, and its larvae appear primitive. The crab is orange, with white spots along the legs. It is reported to have a gentle disposition, despite its ferocious appearance. The Japanese name for this species is taka-ashi-gani literally translating to “tall legs crab.” Their armored exoskeletons help protect them from larger predators such as octopuses, but giant spider crabs also use camouflage. The crab’s bumpy carapace blends into the rocky ocean floor. To further the illusion, a spider crab will adorn its shell with sponges and other animals. Temminck, in his original description, noted that the crab was known to the Japanese for the serious injuries it can cause with its strong claws. 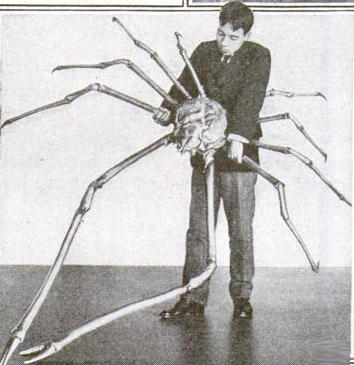 The Japanese spider crab is “occasionally collected for food,” and even considered a delicacy in many parts of Japan and other areas in the region.A total of 24.7 tonnes (54,000 lb) were collected in 1976, but only 3.2 tonnes (7,100 lb) in 1985. The fishery is centred on Suruga Bay. The crabs are typically caught using small trawling nets. The population has decreased in number due to overfishing, forcing fishermen into exploring deeper waters to catch them. Harvesting of the crab is forbidden during the spring, when crabs move to shallower water to reproduce. Populations of this species of crab have diminished over recent years and there are many efforts to protect them. The average size caught by fishermen is a leg span of 1.0–1.2 m (3 ft 3 in–3 ft 11 in).